By Leah Dobrinska. Nov 20, 2018. 9:00 AM. Today is the birthday of John Gardner. Gardner, in most circles, is not so much of a household name as James Bond or Ian Fleming, but he was responsible for keeping the intrigue and excitement of the legendary spy and his author alive in the hearts and minds of fans for nearly two decades. Indeed, from 1981 to 1996, John Gardner penned 16 original James Bond novels. In honor of his birthday, let’s take a look at several of his titles. 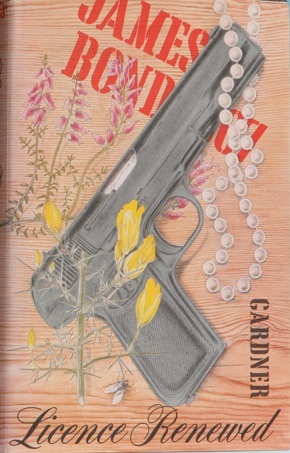 Gardner’s first foray into the Bond series came with the 1981 novel, License Renewed. When Licence Renewed begins, M reminds Bond that the 00 section has in fact been abolished; however, M retains Bond as a troubleshooter, telling him "You'll always be 007 to me". Gardner’s License Renewed was the first continuation of the James Bond series in novel form since Kingsley Amis’s Colonel Sun, published over a decade before. If License Renewed is notable for being Gardner’s first Bond effort, then Cold is equally as notable for being his final one. Split into two parts, Bond is set against a terrorist group that goes by the acronym COLD—Children of the Lost Day. First UK editions can cost collectors nearly $2,000. When Cold was published in the United States, it was titled Cold Fall. GoldenEye was the second of two novels that Gardner wrote based off of film scripts. The first was License to Kill (1989). Both of these novels are worthwhile collectibles, especially for those keen on movie tie-ins. GoldenEye was the first Bond film to star Pierce Brosnan as 007. In this story, Bond works to keep GoldenEye, a satellite weapon, from being used against London in an effort to cause a “global financial meltdown". There are numerous other titles that could be included on our list of Gardner’s Bond books—another 12, to be exact. However, those listed above are some of our favorites—each notable for its own reasons. Interestingly, Gardner himself is quoted as saying, "I'm very grateful to have been selected to keep Bond alive. But I'd much rather be remembered for my own work than I would for Bond". So perhaps the best thing we could do in honor of the author’s birthday is to seek out some of his non-Bond books—of which there are many—like those in the Professor Moriarty series or an early novel such as Every Night's a Bullfight (1971). We also like his later novels in the Detective Sergeant Suzie Mountford series. In any case, we hope you found a book or two on this list that you haven’t heard of or read before.